This help note gives an overview of the available charts in Calxa and the information each chart can deliver. Included with the description of each chart is a thumbnail example that you can click to view at full size. Please be aware that each chart has many options and there are many variations to each of the examples shown. For details on how to display or work with charts in Calxa please refer to the Help Note - Display Save and Print Charts. 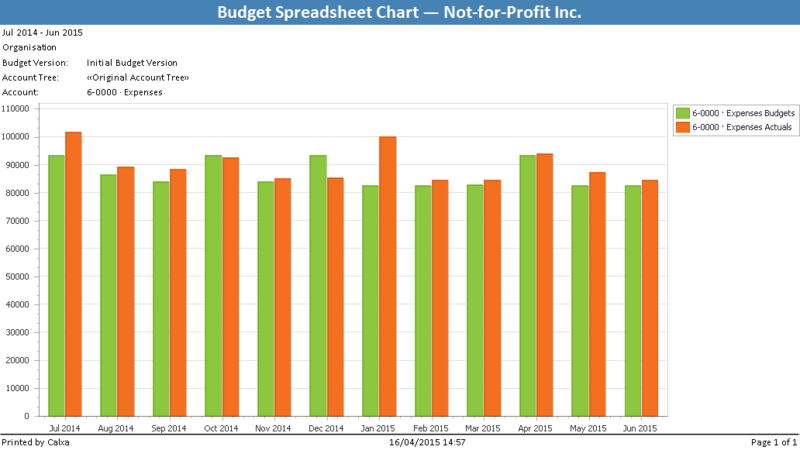 The Budget Spreadsheet chart is a 12 month bar graph where you can compare the Budgets, Actuals, Last year Budgets and Last Year Actuals of any account group within your chart of accounts including profit levels such as Gross Profit and Net Profit. Calxa Premier users may also select an Account Tree for further flexibility with the account groupings. 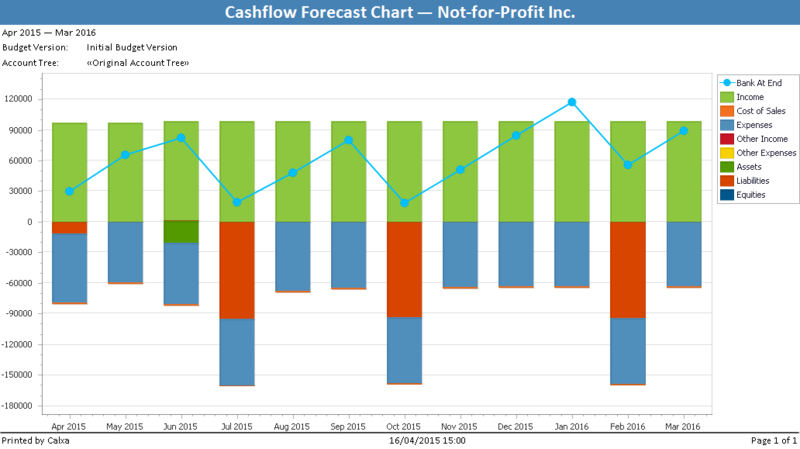 The Cashflow Forecast chart displays your projected cashflow with a combination of a bar and line graph. 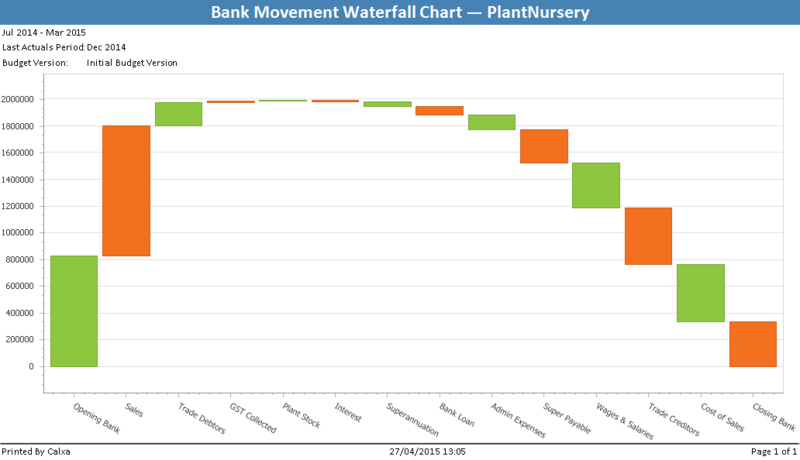 The line graph represents the projected closing bank balance at the end of each period while the stacked bar graph represents the account category movements that make up the bank balance movement for that period. There are a range of timing options including 1 year with monthly periods through to 6 years with annual periods. This chart visually represents the cumulative effect of the positive and negative movements on your bank balance. Starting with the opening bank balance, each bar starts at the position the previous bar finished. 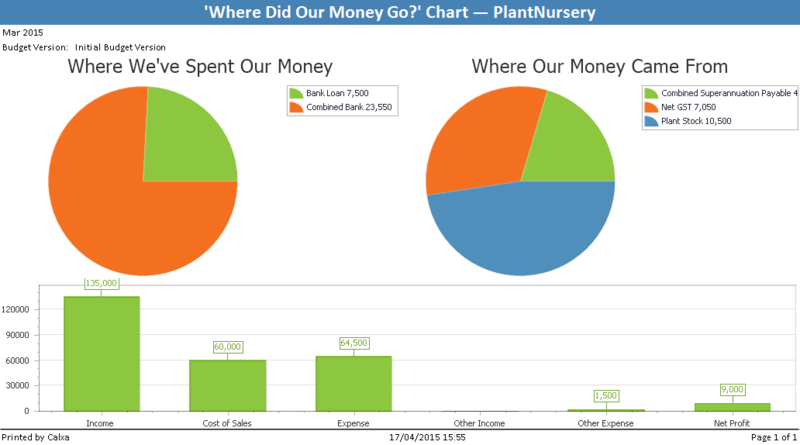 The bars represent the totals from your Account Tree groups such as Income, Cost of Sales, etc. through the Chart of Account (Sort by Account option). You can also choose to sort by value, which sorts from largest inflow to smallest inflow and then through smallest outflow to largest outflow. 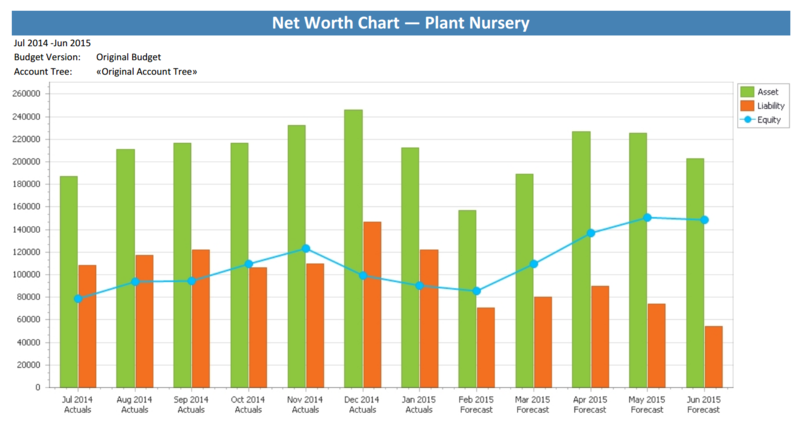 This chart displays your actual or projected Net Worth which is your Equity, using a combination of bar graphs and a line graph. Two bars represent your Assets and Liabilities. A line graph represents Equity, which is the difference between Assets and Liabilities. This series of 3 charts reconciles the profit and loss, to the movement in the balance sheet. 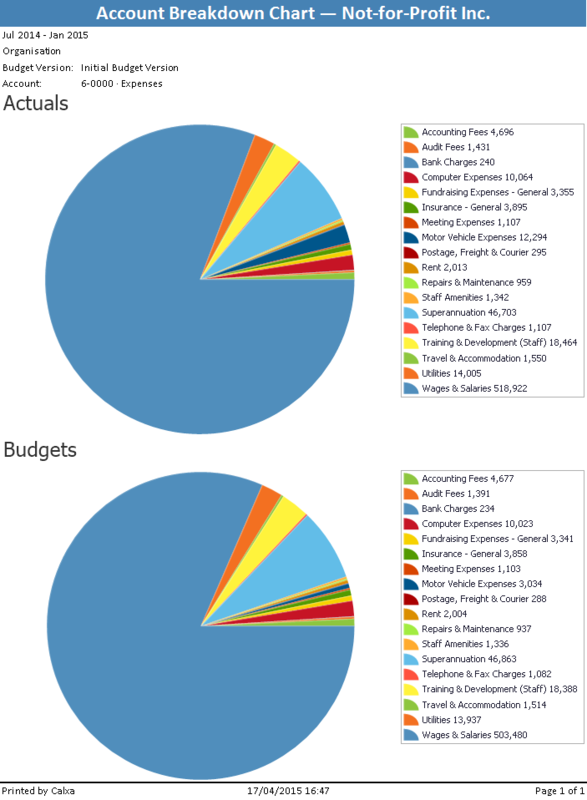 The two pie charts represent where you have spent and received money, reflected as movement in the balance sheet. 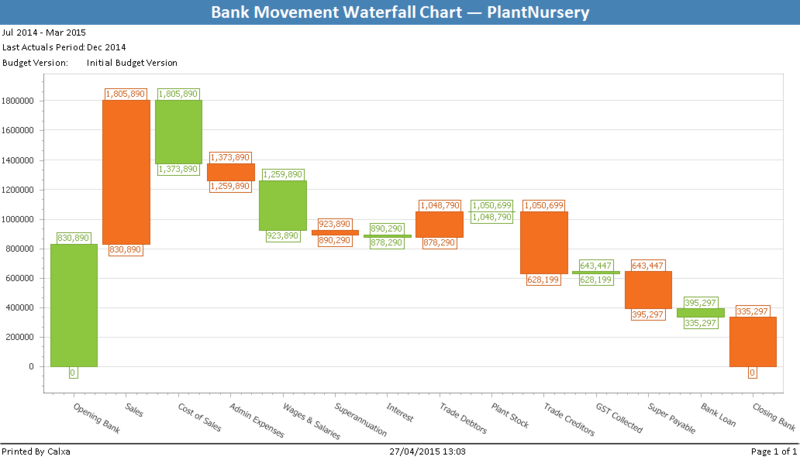 There is also a summary P&L bar graph with single bars for each account type and Net Profit. This chart is a 12 month bar graph where you can compare Actuals, Budgets, Last Year Actuals and Last Year Budgets for any of the default or your own custom KPIs. 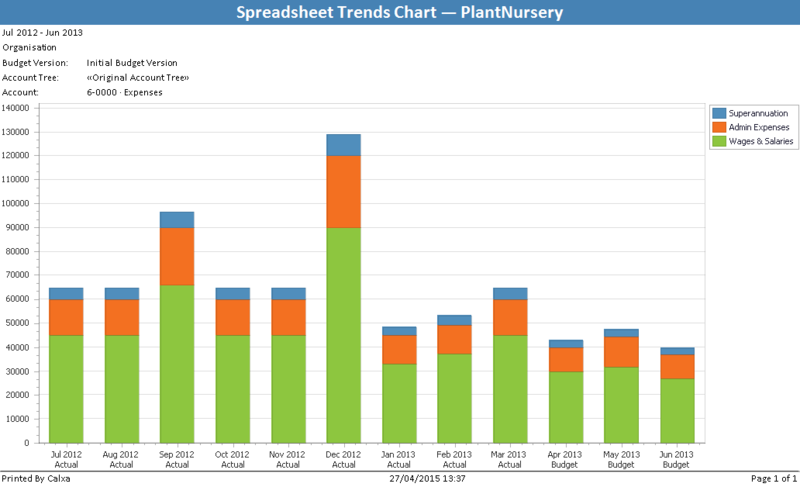 Spreadsheet Trends is a 12 month stacked bar graph where each colour in the stack represents a different group of accounts. You can display either income or expense accounts and gather the report data from any level within your chart of accounts. Calxa Premier users may also select an Account Tree for further flexibility with the account groupings. The values shown are budgets with the option to replace these with actuals up to a chosen period. 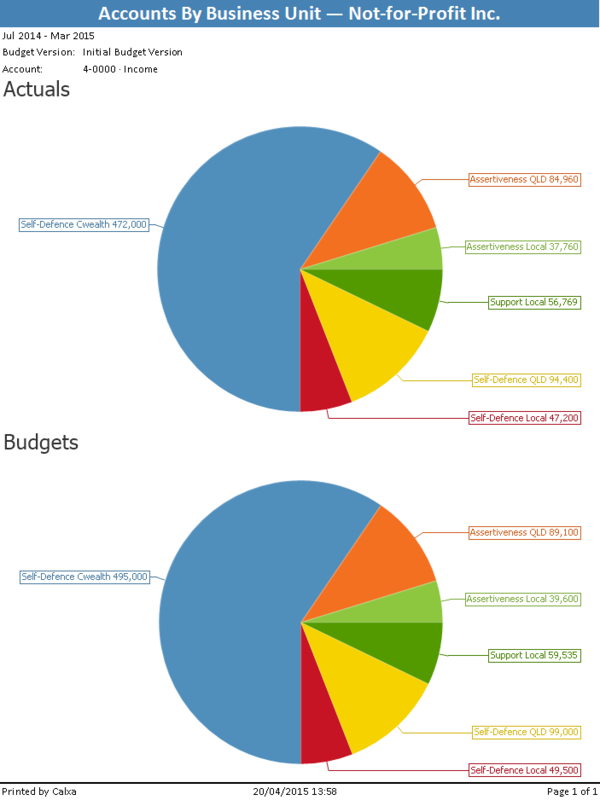 This chart shows both a budgeted and actual pie as separate charts, with each section of the pie showing the individual sub account groups as the percentage portion of their parent account group. You can display either income or expense accounts and gather the report data from any level within your chart of accounts. Calxa Premier users may also select an Account Tree for further flexibility with the account groupings. This is a 12 month combination of a bar and a line graph where the bars represent cumulative (YTD) actuals and the line graph represents cumulative (YTD) budgets. In the report criteria you may choose any account group within your chart of accounts including profit levels such as Gross Profit and Net Profit. Calxa Premier users may also select an Account Tree for further flexibility with the account groupings. 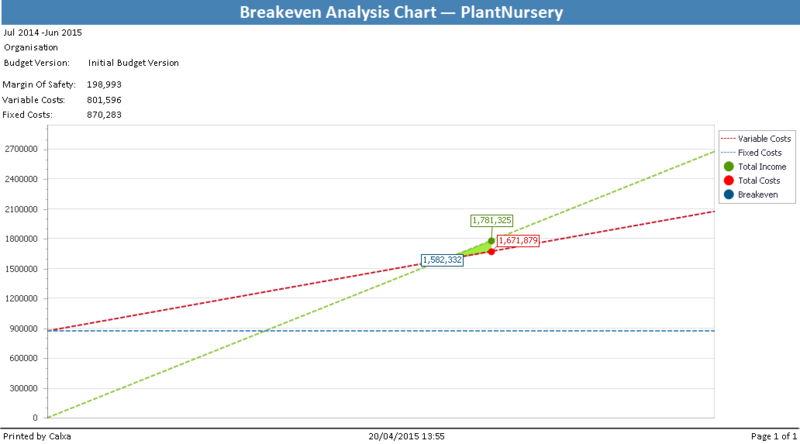 Using an assumption that you have fixed and straight line variable expenses the Breakeven Analysis chart calculates the point at which your income covers your expenses exactly. 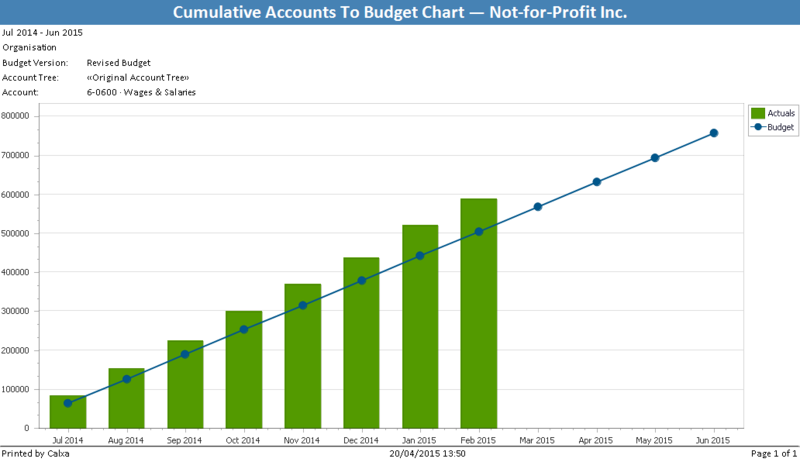 The chart can be calculated for any given date range using budgets or actuals. The two straight lines represent Total Income and Total Costs with the intersection giving the breakeven point. No data can be displayed for this chart if you either; do not have a profit for the reporting period or total income is equal to variable costs. The Accounts by Business Unit pie graph identifies the business unit breakdown for a particular group of accounts or profit totals within your chart of accounts or custom Account Tree. Each business unit is shown as a slice of the pie where the total is a selected group of accounts.